Mobile development has been fascinating to the developer community since its inception. It took many forms before being the platform that the masses could embrace. But, once mobile app development gained ground, it started spreading like wild fire. When the first versions of iOS and Android mobile platforms were unveiled in 2007, more than anything, they were experiments to the developer community. Though coding boot camps, competitions and freebies advertised the arrival of mobile platforms, it was after the initial success of app stores in the following year, the 'Gold Rush' to build apps began. There were stories about developers turning into millionaires over-night due to app downloads. New agencies mushroomed quickly to capitalise on the new service industry. More than revenue, the reason why millions turned towards app development was the excitement of writing code and instantaneously see the app run on a real device. However small the functionality could be, it had utility to someone in this world. Market reach was instantaneous; users were willing to try new things and were patient with the evolving user interfaces. The simplicity, nearness to market and instant feedback were some of the primary factors that led to the success of mobile app development. The growing demand for smartphones only fuelled this growth. The initial expectations from an app developer were to put together a few views and connect the screens. As the adoption started to improve and demand for apps increased, user experience started to gain importance and developers were required to focus on the UI layer more than anything else. This forced the upcoming developers to focus on learning techniques that make the apps look good and match the creative provided. 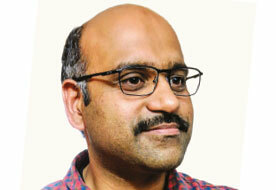 The term 'PixelCEO INSIGHTS Krishna Vattipalli Perfect' became popular and quickly became the new measure of quality. While the apps started looking good and shiny, the structure beneath the UI was missing a strong foundation. That was because, the upcoming developer community was not spending enough time understanding the core principles of programming and instead focused on just 'making it work'. Due to the rising demand for developers and the fear that there may not be enough developers to meet the demand, there is a push to nurture more developers. With advent of training centres, online courses and state sponsored skill development packages (in India), there will be a huge influx of new mobile app developers entering the market. Introduction of new mobile app development platforms and evolution of existing platforms intend to shorten the learning curve for mobile app development. These factors may not saturate the market, but the cost of engaging a developer will surely see a downward trend. The demand that the current developers enjoy will certainly be impacted, primarily the set of developers that cannot provide a complete solution but just focus on stitching views together. Today, even though there are more than 12 million app developers across the world, there are still concerns on the quality of apps that are being developed. Anybody can develop an app, but it takes a very special skill and attention to detail to deliver a quality experience. These apps need to be built fast and are expected to be of high quality when delivered. For a smartphone user, there are billions of apps in the app stores to choose from and if your app doesn't meet the needs or perform well, there is a very high possibility that it will be deleted from the device immediately and it may almost be impossible to get that user back into your app. In short, the choices are many and patience is minimal. An app developer is required to know more than just programming. They need to assess the behaviour of the user, know the hardware capabilities of the device, build a strong app foundation for future enhancements and primarily understand the problem the app is solving. These are not skills that could be taught in a training session, but something that come out of research and exploration. A developer needs to invest in their career, probably own a device that concerns their career so that they have first hand experience of the platform. This will allow them to experiment and explore new ideas. A developer needs to graduate and be a software engineer. Mobile app developers are on the rise and expected to be at 14 million by 2020. The demand for mobile developers is also growing and with the advent of IoT and other technologies, the demand will be even higher. Technology trends are changing at a rapid pace and to be successful in this area, it is absolutely required that all concerned should adapt to the technology advancements at the same pace, or they may be left behind. Self motivation, appetite for research, ability to learn quickly and the willingness to explore are what will define a successful software engineer and differentiate from other developers.